'Ch. 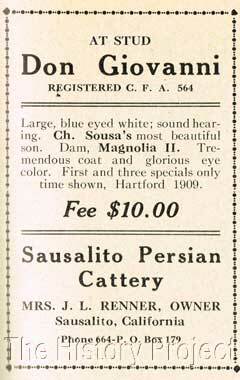 Sousa' stands as an American-bred blue-eyed white male who was a living link between newly imported lines out of England, and an older admixture of white Persian/Angora bloodlines, that had been developed within the United States from foundation stock that had been brought to the American continent in earlier times. 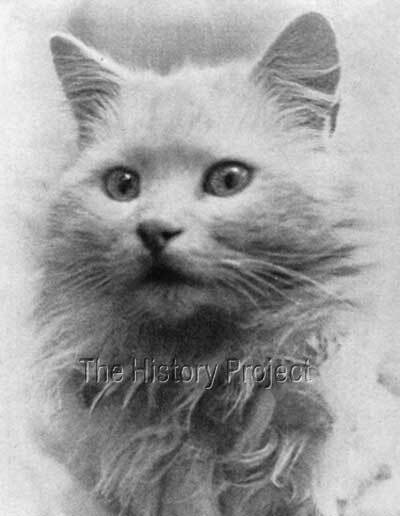 His maternal pedigree included such early hallmark cats as 'Royal Norton' (1898), the famous mainstay of Mrs. Leland Norton's 'Drexel' Kennels in Chicago; also going back to 'Brushwood Caprice'(1893), the dam of Mrs. Colburn's 'Brushwood Paris'; as well as 'Madge'(Norton), an original white female imported directly from Persia. It was from a direct pairing of 'Royal Norton' and 'Madge Norton' that the lovely 'Bydie Young' was produced. For fanciers of White Long-hairs during this period, there were only two main centres into which the majority of the most prominent breeders of whites were located, namely centred in an around both Chicago and New York. In Chicago there was Mrs. Leland Norton (whose lines were based on 'Royal Norton'), Mrs. W. Eames Colburn (with lines based upon her 'Brushwood Paris'), Mrs. Josiah Cratty, (with 'Jungfrau Eiger' bloodlines imported from the continent), and Mrs. Clinton Locke, (with lines going back to 'Wendell' and 'Lord Gwynne'). In New York, there was Mrs. Champion and her daughters recently emigrated from England (with predominantly 'White Friar' bloodlines), Mrs. Brian Brown (with 'White Huzzar' lines) and the relatively new Miss Ava Pollard, who also began with lines from both 'White Friar' and eventually 'White Knight'. 'Sousa' was born against this historical background on 19th October, 1902. His sire, was a newly imported blue-eyed white male 'Prince of Pearls' (BCC: 684)7, who had once resided with Mrs. Pettit in England, but had been imported by Miss Nellie Harvey Wilson (now Mrs. Hurlbert), who lived at that time in Indianapolis, Indiana. 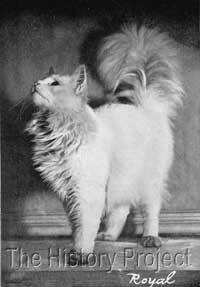 This represented a new and unknown line into the mix, although all that we can find with regard to 'Prince of Pearls' is that he was bred by Mr. Dawson in England, from two unnamed cats imported directly from Persia and owned by friends of Mr. Dawson. 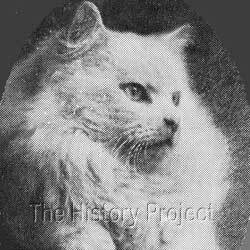 Mrs. Pettit, his former owner in England was in the habit of naming all of her cats 'Pearl', her original male and female being ' King of the Pearls' and 'Queen of the Pearls' respectively and her most famous home-bred females being 'Beautiful Pearl' and 'Piquante Pearl'. Below: 'Royal Norton' maternal grandsire of 'Sousa'. Below:'Brushwood Caprice' maternal Grand-dam of 'Royal Norton'. Below:'Madge' (aka Madge Norton), maternal Grand-dam of 'Maplewood Dainty'. 'Sousa' was bred by Miss Abby M. Clark, of Carthage, Indiana, out of a daughter of 'Royal Norton' named 'Maplewood Dainty'(BCC:613)7. 'Dainty' carried a raft of original white bloodlines, including 'Brushwood Caprice' (BCC:207) and 'Taffy', the sire and dam of 'Chiffon', the dam of 'Royal Norton'. On her maternal side, 'Dainty's' grand-dam was 'Madge Norton', another import from Persia and the damn of the lovely 'Bydie Young'. With 'Prince of Pearls' being located relatively close, the opportunity to combine these established lines with something new would have been very appealing. Mrs. George H Gould, who was to become the new owner of 'Sousa', was based in Ithaca, New York, and needed to forge her own path with new imported bloodlines in order to compete at any level with Mrs. Champion, her daughters Dorothy and Ethel Champion, and the up and coming Miss Ava Pollard. No doubt she had kept tabs on the latest imports and had discovered that a litter was imminent sired by 'Prince of Pearls'. 'Ti Ki Pearl'	Copper-eyed white male, born 23rd April, 1902 (BCC:957)7 out of 'Fairy Pearl' (Imported), bred by Mrs. C.E. Hurlbert, and owned by Mrs. C.G. Swope of Dresden, Ohio. 'Sweet Briar Prince of Pearls'	Blue-eyed white male, born 23rd June, 1902 (ACA:6)4 out of 'Corinne' bred by Mrs. C.E. Hurlbert and owned by Mr. F.G. Hasselman of Indianapolis, Indiana. 'De Reske'	Copper-eyed white male, born 6th October, 1903 (CFA:381)6 out of 'Taidei'(BCC:450), bred and owned by Mrs. I.L. Drake of Fort Worth, Texas. As a blue-eyed white stud, 'Ch. 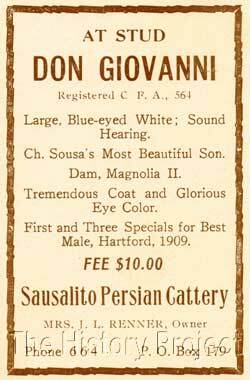 Sousa' was just one in a growing list of blue-eyed white males being retained for breeding in order to expand the available gene pool in the United States, the colour variety being one of the most sought after among long-hairs, alongside the silver (or chinchilla). His traceable list of progeny is not large, but two of his sons in particular, and their progeny, would help to establish a new dynasty of whites, carrying the 'Kilravock' cattery name into long-hair breeding history. 'SUZETTE'	Copper-eyed white female, born 13th April, 1905 (ACA:159)4. Dam: 'Coquette'. Bred and owned by Mrs. George H. Gould. 'CAYUGA LADDIE'	Blue-eyed white male, born 27th September, 1905 (ACA:422)?. Dam: 'Diane of Rosedale'. Bred by Mrs. Ione Owen, Ithaca, N.Y. 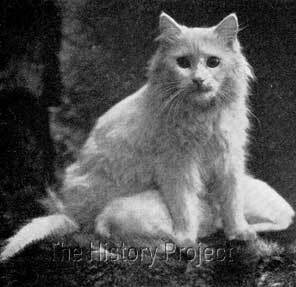 Owned by Mrs. Josephine Hodges, Newark, N.J.
'MY SWEETHEART'	Blue-eyed white female, born 2nd March, 1906 (ACA:580)4. Dam: 'Midget'. Bred by Mrs. J.H. Durfey, Ithaca, N.Y. Owned by Mr. George Mclean, Amesbury, Mass. 'SOUSELLE BELLE'	Blue-eyed white female, born April, 1907(ACA:1065)4. Dam: 'White Lady'. Bred by Mrs. E.H. Church, Corsicana, Texas. Owned by Mrs. M.W. Belle, of Dallas, Texas. 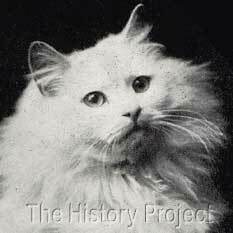 'KILRAVOCK DON GIOVANNI'	Blue-eyed white male, born 9 July, 1908 (ACA:1352)4. Out of 'Kilravock Magnolia II'. Bred by Miss J.R. Kroeh, Orange, N.J. Owned by Mrs. J.F. Renner, Sausalito, California. Sire of, amongst others, 'Woodverge Sweet William' (1910) and 'Kilravock Don Giovanni II'(1916). 'KILRAVOCK DON LEONE'	Blue-eyed white male, born 9 July, 1908 (ACA:2562)4. Out of 'Kilravock Magnolia II'. Bred and owned by Miss J.E. 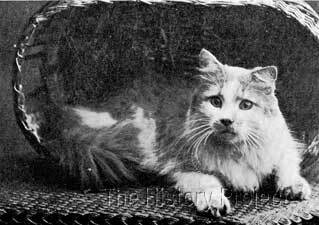 Kroeh, Orange, N.J. (Litter brother to 'K.Don Giovanni'. Sire of, amongst others, 'Ch. Kilravock Janet (1910); 'Ch. Kilravock Don Leone II' (1911); 'Kilravock Donna Carrolla' (1911) and Kilravock Lady Juanita. Images courtesy of The CFA Foundation, Inc.
Stud advertisements for 'Kilravock Don Giovanni' a Blue-eyed White son of 'Ch. Sousa'. 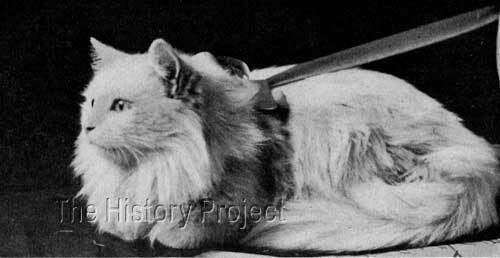 The piecing together of snippets of feline history in order to create a cohesive image for our readers, is akin to putting together a jig-saw puzzle. 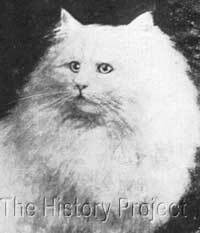 In the history of the white longhair in the United States, 'Ch. 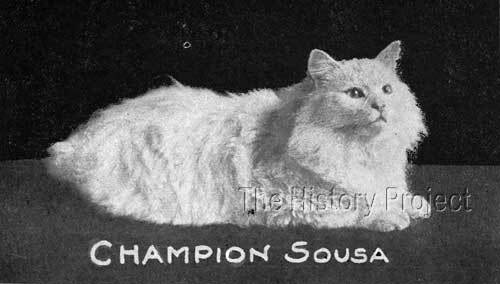 Sousa' represents just one small piece in that puzzle, but one which links both backward in time to the early pre-registry beginnings of the cat fancy in the late nineteenth century, and also forward into the heady days of the early twentieth century. 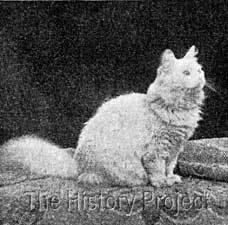 He was just one of a number of foundation stones upon which Miss J.R. Kroeh of 'Kilravock' cattery built considerable success and a reputation for breeding quality blue and copper-eyed whites. 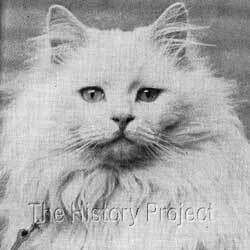 His legacy is not just in the short list of his own progeny, but in providing, through his sons and grandsons, an ever-expanding gene pool from which almost every white longhair in the United States today has benefitted.